It is time once more for the monthly update to Clockwork Empires! 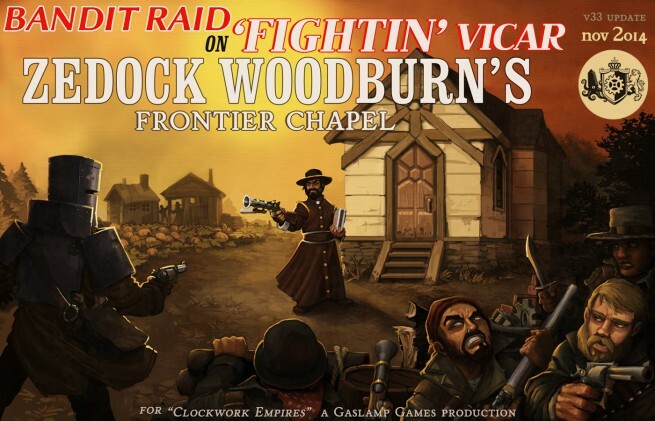 We are now at v33, or as we like to call it, Bandit Attack On ‘Fightin’ Vicar Zedock Woodburn’s Frontier Chapel. Important note: the Clockwork Empires renderer got a huge overhaul. We encourage you to update your video drivers for Queen & Country. OS X users: We thought we had it, but it turns out there’s one outstanding problem owing to having incorrect libraries being loaded – somewhere – for Lua. We’re still tracking this down, and will have this out as soon as we can. Workshops can be given standing orders to maintain a player-defined number of products in the colony at all times. FIXED: Murderers would run away from other murderers rather than murdering them. added alerts for various cases of death due to murder, being marked for justice but getting murdered by cultists instead, and being marked for justice but being killed by something else entirely. added an affliction system – everything can now be hurt in a variety of terrible ways! Bandits will steal your stuff. So mean! Did you update your video drivers yet? Update your video drivers. I’m surprised you went with bandits. If you’re leading a group of colonists into the New Unexploited Unexplored World how come there’s already (quite advanced) bandits? I don’t assume they’re native..
Well, what do you think happened to the previous attempts at colonization? I’m sure some deserted their colonies, were driven from them, got lost(? ), or survived whatever tragedy befell everyone else. Rogue Expeditions: ne’er sanctioned nor sanctified, whe’er by Queen or by Country? Quasi-Conquistadores in service to more Iberian archetypes? Fishpeople all done-up like humanfolk? I like the Ned Kelly bandit in the artwork. Yeah, you won’t like him or his delightful Tin Head Ned armor quite so much when he’s looting your last few bushels of Lingonberries. This is not hypothetical. I think it would be interesting if your colony was being poorly run, that individuals or groups of colonists would splinter off to form new colonies of their own (if organized) or form/join bandit camps for survival. Ya’ imposters!! It was in Call of Juarez first shooter!! But with bandits we need constables, aye? Will be in Clockwork Empires a colonial law enforcement alike old style London Metropolitan police? game seems to improve definately. Just one question – will there be a forestry soon? I always tend to run out of wood after some time. I figured if you leave the stumps alone for long enough, they’ll grow back. Also the bandits are nice, but bandits AND fish folk? Such is life in the Empire. too many crashes, is this normal? I happens when I try to save a third or fourth time, sometime during the second rescue. If bandits and fishpeople attacked at the same time, would an awesome three-way fight ensue? No, probably if it attacks a faction may not attack each other, will be calibrated as well. even your game goes often crash? Out of question will it be possible to hire bandits or commit other dubious actions (like causing infighting etc ) at the cost of resources and prestige? Essentially acts of espionage etc?